From regional players to global titans, income investors have several good options in the fast-food industry. The fast-food business is extremely competitive, yet it delivers impressive returns to the few companies that can win large, defensible market positions. McDonald's, Dunkin' Brands, Wendy's, Jack in the Box, and Yum! Brands are a few of the top stocks that have achieved this rare feat. These companies have each turned food service franchises into robust business models that generate strong dividends for investors. Data sources: Company financial filings and Yahoo! Finance. Sales growth is for the trailing 12 months. With its 41-year streak of annual raises, McDonald's has by far the longest-running dividend on the above list. The fast-food titan's latest gains have been impressive, too. Management boosted the payout by 6% for the 2017 fiscal year. Years of sluggish sales and profits have pushed the chain's payout ratio up to an uncomfortable two-thirds of earnings. Yet McDonald's still boasts some of the strongest financial metrics around, including cash flow, operating margin, and return on invested capital. That's why this fast-food giant is one of safest bets in the industry for consistent payout growth. Yum! Brands owns the popular KFC, Taco Bell, and Pizza Hut properties, which in the past year powered an 18% surge in operating earnings. Income investors might want to take a fresh look at this fast-food specialist now that the spinoff of its China KFC division has left it flush with cash, more focused, and more efficient. Don't let the 76% reported payout ratio scare you away, either. That's an artifact of reduced profits from the spinoff. On a forward basis, Yum! Brands is targeting returning roughly half of earnings directly to investors as dividends. Considering that the KFC and Taco Bell divisions both logged double-digit profit growth last year, with Pizza Hut not far behind at 9%, the outlook for earnings and dividend growth ahead is bright. Dunkin' Brands stands out from industry peers in a few key ways. Its 100% franchised model, for one, makes it an extremely asset-light business. The coffee and breakfast specialist also enjoys a profitable packaged goods business through K-Cup pods, retail packaged coffees, and Baskin-Robbins ice cream products. Dunkin' Brands' dividend has jumped by double-digits in each of the last two fiscal years thanks to healthy profit growth. Future increases will depend on management's success at boosting comparable-store sales growth in the U.S business while expanding the business deeper into overseas markets that currently account for less than 20% of revenue. Jack in the Box has a solid market position through its 3,000 burger and Tex-Mex fast-casual restaurants operating under the Jack in the Box and Qdoba banners, respectively. Like most of its rivals, though, the company suffered from a sharp growth slowdown last year. Comps fell from a 6.5% pace to a 1.2% pace at Jack in the Box locations and from 9.3% to 1.4% at Qdoba. 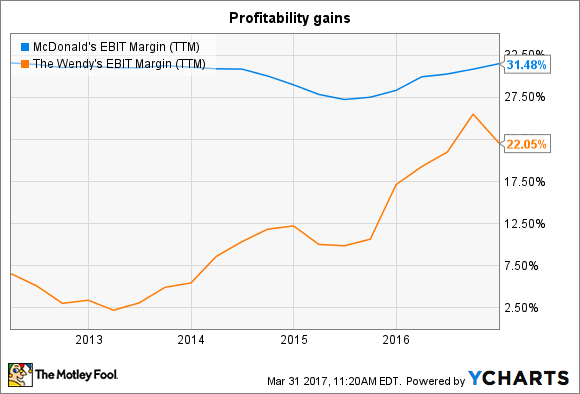 Earnings continued rising through that downturn, which is a testament to management's success at holding costs down. Yet the company's low payout ratio and short dividend track record (just three years so far) suggest that executives have bigger priorities for their capital right now. Wendy's is aggressively expanding its store footprint, but the improving economics of the business has investors even more excited. Adjusted profitability rose to 27% of sales last year -- double the result from 2012. Management credits consistent sales growth, rising franchise fees, and aggressive cost cuts for delivering the gains that have put it closer to industry leader McDonald's. MCD EBIT Margin (TTM) data by YCharts. Executives aren't satisfied yet, though. In fact, Wendy's financial targets call for adjusted margin to reach as high as 40% by 2020, at around the time the business passes 7,500 locations and generates $12 billion in annual sales. That equates to an extra $2 billion of yearly revenue. And since Wendy's targets delivering over half of earnings to shareholders as dividends, it's likely that income investors will receive market-beating raises while the business grows.